Do you know why you write fantasy? In his 1916 essay (not published until 1956) The Transcendent Function the psychologist Carl Jung describes his system of ‘active imagination’, the technique at the heart of the psychological process he named individuation. Put very simply, active imagination means to dive down in to our imagination and to bring back from it visions, dreams and stories. 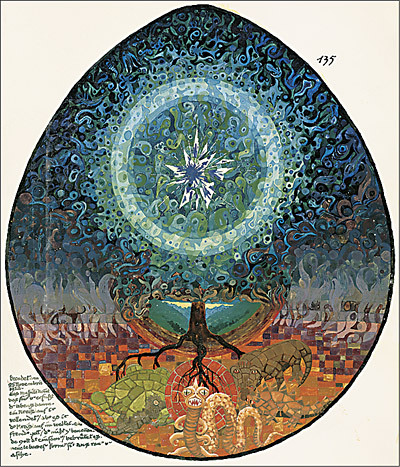 Among the products of Jung’s own experiments with active imagination is the Liber Novus or Red Book. Jung produced this work as part of a period of intense introspection following his break from his mentor Sigmund Freud. In 205 pages of hand scripted calligraphy and intensely beautiful illustrations Jung recorded his own visions, dreams and stories. Most writers of fantasy can probably recognise themselves in Jung’s creation of the Red Book. Many writers come to writing fantasy in periods of change, following trauma as as part of a process of recuperation. I have a box of fragmentary short stories labeled Titan that I produced in the years after I lost my mother to cancer. I put them aside for many years, but ideas from them make up part of my work-in-progress novel Lost Things. Goals like publication and perhaps becoming a professional writer can be important parts of a creative practice. But it’s easy to lose sight of the truth that your writing is probably there to play a much more important part in your life than generating revenue from unit sales. It’s taking you on a journey…where to only you know…and the visions, dreams and stories from which great novels are made will only come if you stay on the right path. For me it has to do with the decomposition of reality and what’s hidden in the collective subconscious. I’m more concerned with the fiction that is hiding within the cracks of genres, where dark things happen and just hang around, experience and explore. It’s through this exploration that I see the world clearer. this made me wonder why I don’t write or read or watch fantasy, why am I rooted so deeply in the quotidian?